Adaptive management is often referred to as 'learning by doing'. More fundamentally, adaptive management provides a pathway for proceeding forward with managing complex systems or projects in the face of uncertainty. 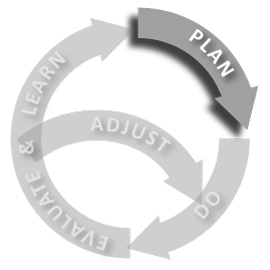 The classic adaptive management loop consist of five components: 1) Planning, 2) Doing, 3) Evaluation, 4) Learning, and the option to 'Adjust' as needed. That 'adjustment' on the basis of evaluating what was done can lead to adjustment of conceptual models, adjustment of plans or adjustment of actions. Adaptive management uses the formulation of a plan based on the best available information and articulation of a conceptual model of how the system works with predictions about how it should response to management actions. One of the hallmarks of good adaptive management is that, multiple competing responses to management actions can be identified prior to actions (i.e. 'DO'ing). A decision/plan can be made on the basis of the predicted response, but if alternative, unforseen, or undeseriable outcome take place instead, management responses can be identified ahead of time. This allows competing concerns to be recognized, addressed and used to help craft the plan. The classic adaptive management loop. Example of a simple, temporary V-Notch weir installed to measure flow and address water user's concerns about BDAs impacting their ability to irrigate. 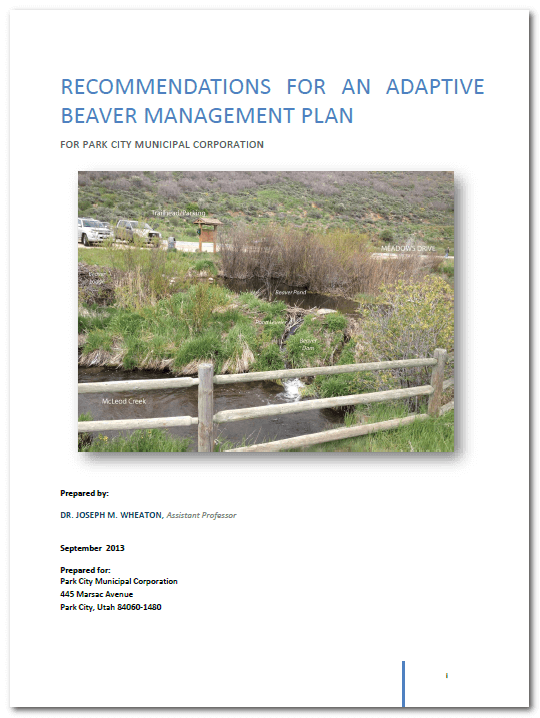 We recently had a project where we were going to install some beaver dam analogues. 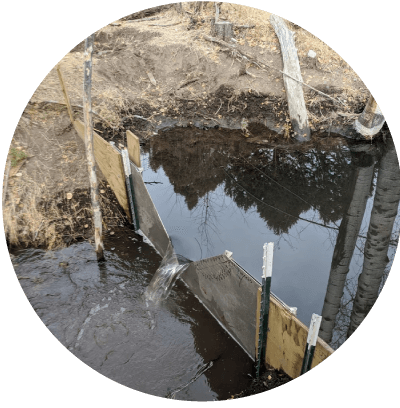 Most the science on hydrologic impacts of beaver dam impacts suggests that peak flows are often reduced, that flow is attenuated in temporary storage in ponds and groundwater, and slowly released out in the weeks and months that follow (often resulting in an increase in baseflows). However conceptually elegant that sounds, there is still a common perception in the West that any obstruction to flow will impact downstream water users, and that beaver dams will 'steal' water from downstream water users. In this recent project, these concerns almost killed the project. Using adaptive management, we were able to salvage the project. We worked with a concerned downstream water user to better understand their concerns, and their operations (i.e. when they were diverting and how that water impacted their operations and ability to grow late season hay and feed). Identified our predicted flow response to installation of BDAs and the downstream water user's concern. Installed some simple V-notch wiers to measure flows upstream and downstream of the project. Committed to mitigating and, if necessary, removing the BDAs if the flow data shows they are negatively impacting the downstream water user. This simple adaptive management solution, allowed us to proceed with a 'plan' and 'doing' in the face of uncertainties. Through monitoring the response and outcomes, we will learn and if necessary adjust our actions as appropriate. In Bouwes et al. (2016) we lay out our vision for how adaptive management can move beyond something only the biggest projects with the healthiest budgets can afford, to something we can and should as routine practice on almost every restoration project. At left is an example of more specific actions tied to the adaptive management loops. These plans can be cheap to prepare and simple to implement.